While browsing in TKMaxx I spotted this OPI Mariah Carey 4 Mini Holiday Hits. Growing up I was a huge fan of Mariah and "All I Want for Christmas is You" is still one of my favourite holiday hits. So obviously I was pretty happy to get my hands on this nail set. 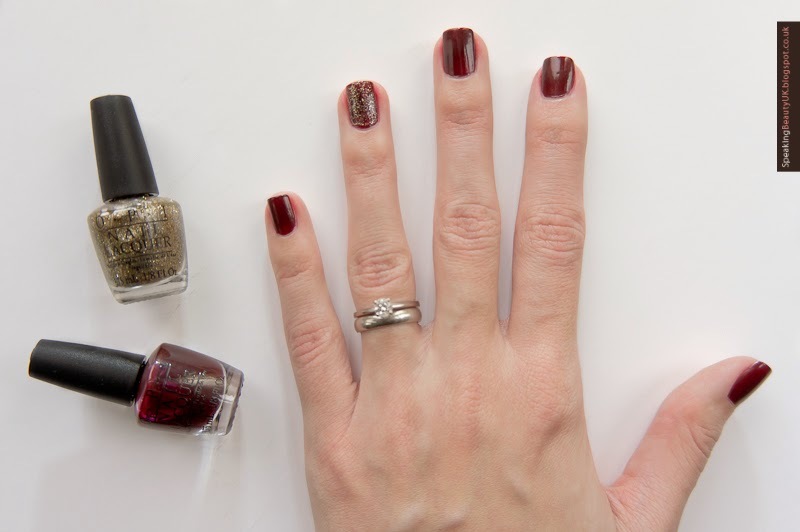 It's gorgeous and sparkly and the perfect nail colours for Christmas. As you can see, the polishes are pretty small, having only 3.75ml (full size OPI polishes have 15ml) but I think these sets a great way to try new shades and formulas without breaking the bank. And as with all OPI nail polishes, you get high shine finish and the overall quality is really good. This set comes with a deep red polish (Vision of Love), a rich chocolate one with some shimmer (Warm Me Up), plus two polishes with different tones of golden glitter (Wonderous Star & All Sparkly and Gold). Those would be great as a top coat all over or just on the ring finger, to add a sparkly detail, as I wore them in the photo below. So pretty! I love the final look. It's the traditional red and gold combo but without being too loud, which I really like. I wore this to my work Christmas Event and got some compliments.